In my first post about Poverty and Affluence I wrote to you about the surroundings of the environment and their effects on some of the neighborhoods in Queens.. After attaining more knowledge through the course of Urban Studies, I want to revisit some parts of Queens that need clarification as to what kind of socioeconomic issues are being faced. I mentioned previously how I grew up in Sunnyside, where it was more working class people with families living in the area. Many changes have taken place such as rising rent cost and gentrification. The area is opening up many European restaurants that I noticed have an outdoor area taking up public space which is appealing to the upper class but surely affects the sidewalk which is meant to be public. Restaurants are privatizing public property for the sake of business and appeal. A few nights ago I noticed that a bouncer was hired at a bar/restaurant that had never had one previously. Even the Burger King in the area also had a massive face lift, which was probably necessary. It just goes to show how the area is increasing in wealth. With everything becoming more costly, people of low income are slowly starting to disappear from the area. Before there used to be so many colorful faces and now it feels as though I stepped into a golf club somewhere out in Connecticut. The disappearance of low income and middle income families is an issue in itself. Since resources are becoming limited due to cost it affects the living standards, transportation, and many other factors. This means that the working class is being pushed out of the area making it harder for them to commute to their jobs, having to find new jobs or even having to move to other states depending on their circumstances. Although racial steering was supposed to be stopped by the Fair Housing Act of 1968, it is still very much alive like racism itself. Racial steering is the act of being steered away from an area you would like to live in because of your race or national origin. Simply if you are not white and you want to live in an area that is predominately white the real estate agent will try to lead you away. If you are white they will bring you to nicer areas (much like Sunnyside) that have a “potential” to grow. Even with an “affordable” housing complex to be built, it is mostly in favor of upper class residents as mentioned in my post “Sunnyside Gentrified!”. People of color are grouped up into specific areas like Flushing for East Asian immigrants, Jackson Heights with mostly South Asians, Corona with Central/South Americans and South Jamaica with majority of Black Americans. Most of New York City is on the raise of gentrification and that means even areas that were ghettos to immigrants or people of color are now becoming taken over by working/upper class white Americans. That’s racial steering at its finest because if an area is becoming wealthy or has “potential” the real estate agencies and the FHA will push whites to live in those areas in order to bring up value. With Citi Field finally getting more publicity and being used not only as a baseball field but also as a concert stadium the value of the area surrounding it is increasing. It’s close to the airport and convenient for famous artist to do events at the stadium. Based on the Politics of Bread and Circuses by Peter Eisinger this affects the all the communities leading up to this tourist/upper class venue. The entertainment venue now appeals to anyone that wants to go to the concerts. People even come from out of state to go there. 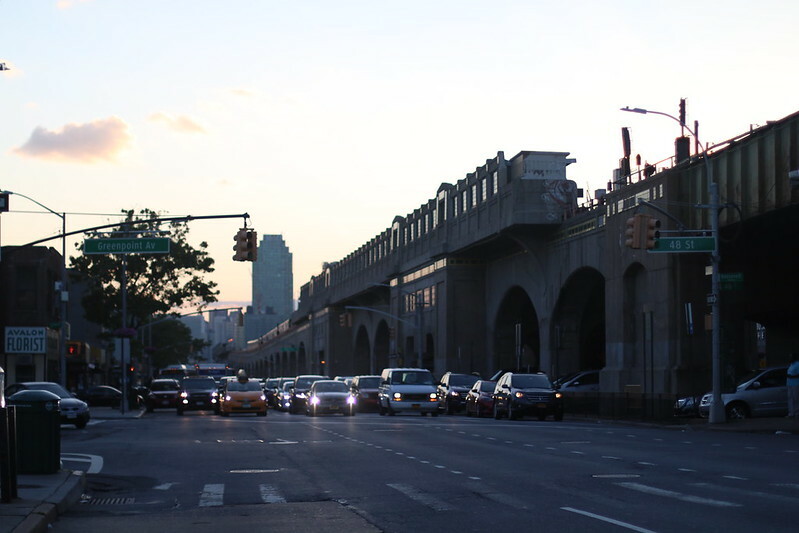 This affects the flow of traffic on all the major highways as well as local roads like the Grand Central Parkway, Roosevelt Ave, Queens Blvd, and L.I.E. The 7 train (being the only train) gets packed full of concert goers and believe me it’s not like when you have Mets fans on the train. Just more annoyances for people of the areas to deal with on their way home from work or school. This adds to more policing in the area to keep away homeless and make it suitable for “visitors”. There is definitely more militarization of police in the major areas aforementioned. I have even seen a little police watch tower they have put up near 80th street and 37th Avenue, and it’s an intimidating look for the area. Sometimes it’s necessary but when gentrifying an area it is one of the key aspects you will notice. How else are they going to protect the upper class newcomers? Even seeing more police vehicles patrolling is somewhat a good thing. I feel it would be even better if they wouldn’t discriminate against people of color assuming we’re up to no good. I see that for the middle and lower income people of Queens it is becoming difficult to maintain resources. The change I am seeing is ongoing and will continue, but I feel it will continue until there is another great depression or city wide recession. I say this because “the rich get richer and the poor get poorer.” and our country is in $19.9 Trillion in debt. A part of me now knows the truth about how the true american society works and the systematic racial disparities that people of color have to face. Maybe it’s about time we all educate ourselves a bit about the truths that are being swept under a rug. Maybe it’s time for people who are living so comfortably to see, feel and possibly empathize the inequalities of the less fortunate, through the words of my own or the words of others speaking the same tune in forms of writing.